One common question among budding cooks is which would win in a contest between a Dutch oven versus slow cooker? And while these 2 pieces of cookware have some notable similarities, there are also many important differences as well. However, no matter which cookware type you choose, you really can’t go wrong. Furthermore, both a Dutch oven and a slow cooker have their strengths and weaknesses. And while these differences will dictate what you can prepare in each piece of cookware, there is a lot of overlap between the two. That’s why in this article, we will be taking a look at the benefits and downsides of each type. Likewise, we’ll also give our top choices for both Dutch ovens and slow cookers. Finally, we would like to add that this article is not a dig at either piece of cookware. However, it will help you answer the question of when to buy a Dutch oven versus slow cooker. Here are just a few examples of some of the best Dutch oven benefits. Keep in mind, that these benefits are not all exclusive to Dutch ovens. However, the biggest draw for Dutch oven fans is the sheer versatility this cookware type brings. So, let’s start with the top benefits of Dutch ovens, followed by a more in-depth discussion of each. This will not only give a quick at-a-glance list but will also give you a deeper look into each topic. With that said, let’s begin, shall we? On average a Dutch oven will allow for faster cooking times than with a slow cooker. There is a reason why it’s called a slow cooker after all. And while there won’t be an incredibly large difference, you’ll definitely save some time. So how do you convert a slow cooker to oven temp in a Dutch oven? Well, using a dutch oven conversion chart to convert cooking times from a Dutch oven to slow cooker will come in very handy. While you can easily throw in multiple ingredients into a slow cooker for set-and-forget meals, there are exceptions. If you need to sear meats or saute vegetables than a Dutch oven will be your best choice. This is because you’ll be able to seal in juices while not having to use multiple pans. For instance, if you were to make beef stew in a slow cooker, you might want to sear the meat first. However, you would need to cook the meat separately in another pan. And if you wanted to saute vegetable, you would also need to do this in another pan. If you used a Dutch oven straight away, you could do all of these tasks in that same Dutch oven. Additionally, this will cut down on cooking time as well as cleaning time. In conclusion, in many cases, a Dutch oven will not only be more versatile but also more efficient. If you own a non-enameled cast iron Dutch oven or pan, you can receive a small amount of nutritional iron in your diet. This is beneficial to anyone who does not get enough iron in their diet or who do not have an iron sensitivity. Simply cook in your Dutch oven like you normally would and reap the benefits of cast iron cooking. And while you won’t receive a large amount per meal, when the meals add up it can be of great benefit to your health. This is a feature most slow cookers cannot compete with. Click here for our article on Cast Iron Dutch Oven Benefits for more tips and information. In most cases, Dutch ovens will have a slightly higher temperature threshold. This will not only open up more opportunities to try out new recipes but will also cut down on cooking time as well. And while slow cookers can reach high temperatures, they are called “slow” for a reason. Slow cookers simply work better with lower temperatures over longer periods of time. Slow cookers simply work better at lower temperatures for longer periods of time. This is in contrast with Dutch ovens, which can often be cooked at 500-degrees or higher. And this is not to say slow cookers can’t reach close to 500 degrees, it’s just that they are typically not designed for that type of use. In most cases, non-coated cast iron Dutch ovens can be used outdoors as well. This not only adds much versatility to your cookware but also prevents you from having to buy outdoor cookware. Additionally, you’ll be able to cook over a fireplace, campfire, and even a fire pit. With a plain cast iron Dutch oven, the possibilities are near endless. As you can clearly see, a Dutch oven is a smart choice for anyone who wants the versatility, convenience, and ability to use outdoors. Furthermore, while there are some minor issues with using a Dutch oven, you’ll find that they are definitely worth owning. With that said, let’s move on to some slow cooker benefits. A slow cooker is one of the best investments you could purchase as well. This cookware favorite can be used for stews, soups, casseroles, lasagna, baked spaghetti, and so much more. Furthermore, a slow cooker is a favorite for Super Bowl parties and holidays. This is because slow cookers in general, are set and forget. Simply place all of the ingredients inside, turn the heat up and just wait. Likewise, you can cook large cuts of meat over several hours while you are working. All in all, a slow cooker s a very smart choice for any size family. With that said, let’s take a look at some great slow cooker benefits. Slow cookers, like their Dutch oven counterparts, come in many sizes and capacities. And while Dutch oven s can be found with capacities of 20-quarts and above, the price may be an issue. Furthermore, it is not out of the ordinary to find slow cookers in excess of 24-quarts. The larger sizes will definitely come in handy for Superbowl parties and family get-togethers. Likewise, you’ll be able to cook large batches of meals to portion out for the rest of the week. Either way, a slow cooker will usually come out on top in the capacity department. The larger sizes that slow cookers afford. allow you to easily prepare large cuts of meat to cook while you are at work. Additionally, by cooking cuts of meat at a lower temperature longer, you’ll ensure tender and moist meat every time. There is no doubt that a Dutch oven is extremely versatile. And there are many Dutch oven slow cooker recipes that will overlap. However, once you own a slow cooker, your cooking aspirations will expand. Everything from apple butter to lasagna and even chocolate brownies and cupcakes. The possibilities are fun and endless. One of the best things about cast iron cookware is its resilience and taste it adds to meals. However, one downside is the fact that cast iron cookware must always be constantly re-seasoned. This is a fact that can not be ignored. And while it’s more than worth the trouble, it can also be a pain at times. This is where slow cookers shine. Their enameled cooking surface makes seasoning a thing of the past. Furthermore, since the cookware is enameled, cleanup is always a breeze. And best of all, most Dutch oven pots can be placed in a dishwasher for added convenience. One of the biggest advantages of slow cookers is the fact that they are on average, cheaper than Dutch ovens. And at the time of writing, you can pick up an 8.5-quart slow cooker for under $50 at Amazon.com. This is why most people own a slow cooker compared to a Dutch oven. They are not only versatile but also very affordable. Finally, slow cookers will, on average, cook larger meals and batches of food for later use. This will not only save you time but money as well. At the end of the day, you really can’t go wrong with a slow cooker. This versatile piece of cookware will not only be simple to use but also easy to clean. Additionally, a slow cooker will make more than enough food for even the hungriest of families. Either way, we highly recommend a quality slow cooker in every home, you won’t be sorry. Owning a top quality Dutch oven will be worth its weight in gold. And while that may be an exaggeration, the sheer number of great recipes you can create is astounding. Furthermore, whether it’s an enameled Dutch oven or plain cast iron one, your family will definitely thank you. So which Dutch oven do we recommend? Well for our pick, we chose the Lodge EC6D43 Enameled Cast Iron Dutch Oven. This workhorse features a cast iron body with an enameled coating, so you’ll get the best of both worlds. With its large 6-quart capacity, you’ll no longer worry about not preparing enough for your family. This Dutch oven has received a large amount of positive feedback and high ratings. And the 500-degree maximum oven temperature will allow you to cook recipes lesser Dutch oven would struggle with. 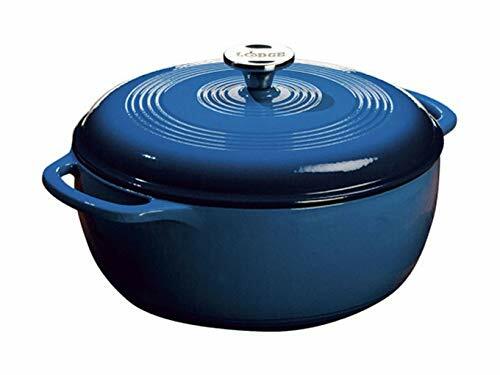 To sum it all up, the Lodge EC6D43 Enameled Cast Iron Dutch Oven is in a category all its own. This piece of cookware will not only last but it will also prepare quality recipes the whole family will love. Is it any wonder why we chose this Dutch oven? In case you are not aware, we have a soft spot for both Dutch ovens and slow cookers. 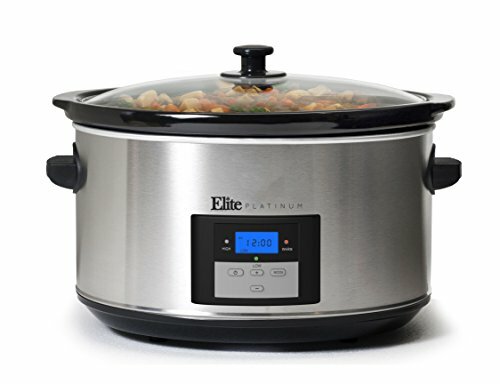 And one of our favorite slow cookers is the Elite Platinum 8.5 Quart Programmable Stainless Steel Slow Cooker. This versatile kitchen appliance is not only great to look at but also simple to use. At 8.5-quarts, cooking for a large family will no longer be an issue. Additionally, the digital programmable timer will allow you to cook meals for up to 20 hours. And the handy, low, high, and keep warm settings will ensure set-and-forget meal preparation. The oval-shaped design will allow for larger cuts of meat to be placed side by side with room to spare. And the brushed stainless steel finish will clean up quite nicely. Furthermore, the handy tempered glass, clear lid will allow you to keep an eye on your meals if needed. Finally, the stay-cool handles and knobs will make transport a breeze. In conclusion, the Elite Platinum 8.5 Quart Programmable Stainless Steel Slow Cooker offers great looks at an affordable price. With so many features, you would be crazy not to give this slow cooker a second look. Dutch Oven Versus Slow Cooker – Which Is The Overall Best Choice? This is a very difficult choice. We have two giants in the cookware industry, each with their pros and cons. Each with strength and weaknesses. Furthermore, to say that one is better than the other is quite foolish. As a Dutch oven fan for life, I must say, I would not want to cook without a slow cooker. And there are definitely recipes that will greatly benefit from being prepared in a slow cooker. However, when I prepare meals I do not need to leave the recipe unattended. This is just my way of cooking. Like I previously stated, I have a soft spot for both. However, my preferred piece of cookware is still the trusty and timeless Dutch oven. I would not want to cook without either one, it’s just for me, I cook more meals with a Dutch oven. So, for that reason, if I had to choose between a Dutch Oven Versus Slow Cooker, the handy Dutch oven wins it for me. Well, there you have it. Our article comparing a Dutch Oven Versus Slow Cooker. We hope that you have found this article helpful. And we must make it clear, we do not dislike slow cookers. We actually love them. However, we are just used to preparing Dutch oven meals instead. Thank you very much for taking the time to read our written piece. We hope to see you again soon. And we also hope that this article will help you better decide between a Dutch Oven Versus Slow Cooker. Heck, you might even own or want to own both. With that said, have a great day and as always, please take care.